President / Skyscraper Defense, Inc.
On September 11, 2001, as I watched the horror unfold on television, I expected a squadron of heavy-lift helicopters to descend upon the towers spraying foam cannons and rescuing people. However, to my dismay, the only helicopters I saw were the observation type, and they all hovered a safe distance away. I even attempted to call New York’s fire department to suggest they conduct the operation from outside the buildings; but the lines were busy. I knew there had to be thousands of people trapped inside and I was deeply concerned that firemen coming up the stairs would never make in time. ROOF TOP DOORS TO BE LOCKED! The engineers who built the World Trade Center factored in enough resilience to withstand the impact of a large commercial aircraft. Unfortunately, the authorities responsible for insuring the safety of the occupants didn’t make the same preparations. If they had, they would not have ordered the antennas to be replaced, the roof access doors to be locked, and dismissed the use of helicopters. Moreover, they certainly would not have ordered their own men up the stairs, knowing it would take hours to reach the fires. If the engineers had the foresight to plan for such a ‘worst-case scenario’, why didn’t the department heads at the fire department and the Port Authority pay attention? The decision makers responsible for the colossal failures at the World Trade Center during 9/11 need to be replaced. Their inaction cannot be tolerated by a society concerned with matters of safety and security; people lives are at stake. Feuds between departments sworn to protect us have no place in our world. Success demands we unite, work as a team, and share ideas without fear of ridicule. 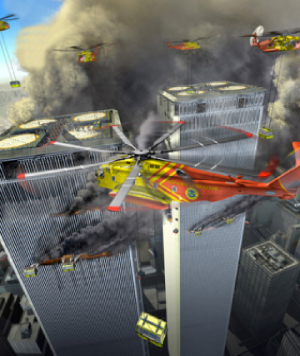 Given the extraordinary heights of today’s skyscrapers, helicopter pads are an essential tool for high-rise rescue. Existing skyscrapers, future skyscrapers, and those currently under construction, must be required to incorporate helicopter-landing zones. High-rises like the New World Trade Center (a.k.a. The Freedom Tower), the single building replacement to the Twin Towers, is in dire need of multiple zones for helicopters to land. It’s not too late. In fact, I have designed pads for the new WTC tower that I am more than willing to share with the architects. And the beautiful thing is, their design doesn’t have to change one bit. The symbolic torch can stay while multiple landing zones stand at the ready nearby. Even the Citicorp building in New York City with its angled roof is capable of having helicopter pads engineered into its existing design. It’s all a matter of perspective. Once you have opened your eyes to all the possibilities, a rescue operation from the ground floor ceases as a primary option. Anyone who has spent time at a world-class ski resort knows about cable cars and gondolas. Stemming from the early 1900’s, these machines are capable of whisking large loads of people to the summit. Why not create fleets of fireproof gondolas, stock them with medical and firefighting equipped, and insert them into the firefighting/rescue equation? Imagine… Gondolas loaded with firefighters being lowered from helicopters through billowing clouds of smoke onto a roof of a burning building… Firefighters charging from the gondolas… Stranded building occupants filing aboard… Powerful hydraulic winches on the helicopters lifting the gondolas… Cheering humans flying to safety! If you can conceive it, you can achieve it. Don’t let anyone tell you different!